In her first standalone film, Black Widow (Scarlett Johansson) juggles an internship at Fashion Weekly magazine and a complicated relationship with boyfriend Ultron. 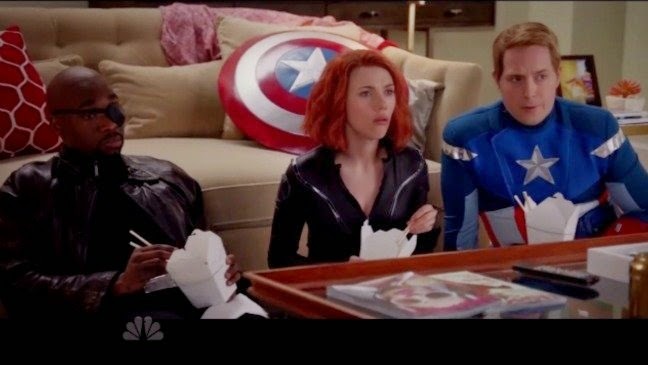 Since Marvel has refused to feature Black Widow in her own solo film, Saturday Night Live has imagined what a movie trailer would look like if they did. Host Scarlett Johansson plays the unlucky in love character Widow, in a spot-on parody that covers many of the awful tropes found in modern romantic comedies. The contrived chance encounter with a stranger, the gay best friend (Thor, who knew?) with sage advice, and that one simple-minded thing about her only her true love would know. Whether or not it's worse than the forced romance in Avenger: Age of Ultron is up to you.